Who&apos;s using the most water in Salt Lake City? 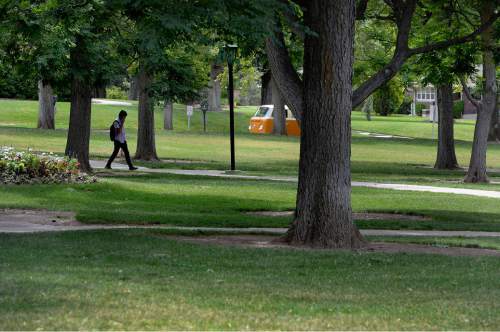 Scott Sommerdorf | The Salt Lake Tribune The area behind the Student Union has large nicely-greened lawns inside a network of walking paths, Friday, July 10, 2015. Despite efforts to conserve and xeriscape, the U has six zones that show up in the top 20 list of Salt Lake City water users. 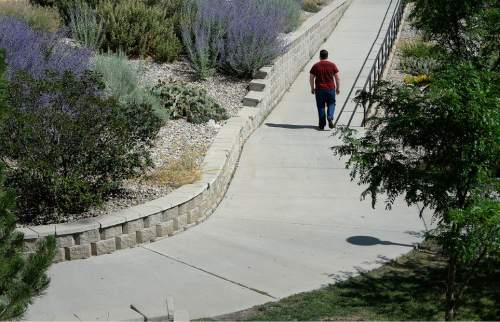 Scott Sommerdorf | The Salt Lake Tribune An area near the Legacy Bridge on the east side of the University of Utah campus has some xeriscaped areas next to lawns, Friday, July 10, 2015. Despite efforts to conserve and xeriscape, the U has six zones that show up in the top 20 list of Salt Lake City water users. Scott Sommerdorf | The Salt Lake Tribune President's Circle is a lush, park-like zone, Friday, July 10, 2015. Despite efforts to conserve and xeriscape, the U has six zones that show up in the top 20 list of Salt Lake City water users. 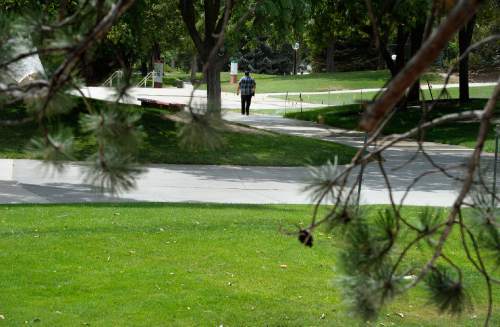 Scott Sommerdorf | The Salt Lake Tribune The area behind the Student Union has large nicely-greened lawns inside a network of walking paths, Friday, July 10, 2015. Despite efforts to conserve and xeriscape, the U has six zones that show up in the top 20 list of Salt Lake City water users. The University of Utah, Tesoro and Chevron oil refineries and municipal golf courses drank up the biggest share of Salt Lake City&apos;s water in 2014, according to city utility records. Tesoro&apos;s meters claimed two spots among the city&apos;s top five users  logging more than 450 million gallons of water. Utah&apos;s flagship university earned six spots in the top 20, slogging through more than 481 million gallons. And 2014 was a big water year for municipal golf courses, which bathed in more than 333 million gallons, combined. Conservation advocates say the numbers highlight the hypocrisy of government leaders, who encourage residents to "slow the flow" while running the faucets in public spaces. But utility managers say they&apos;re working to decrease water use, and conservation efforts are showing success over time. "Since the year 2000, our community has reduced overall water use by 20 percent," said Laura Briefer, deputy director of the Salt Lake City Department of Public Utilities. And University of Utah spokeswoman Maria O&apos;Mara said the school&apos;s hefty utility bill is a product of its size  tens of thousands of students, faculty members and visitors to its on-campus hospitals. "The university&apos;s population swells to the size of a South Jordan or a Layton every day," she said. Conservation efforts on campus include low-flow irrigation systems and water use requirements for new buildings. 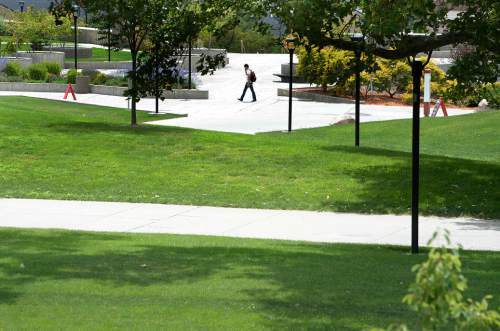 University sustainability manager Stephanie Dolmat- Connell said several open spaces landscaped with thirsty turf grass have been replaced with desert-friendly xeriscaping. And the U. is researching ways to reduce the water used in faucets, labs and sprinkler systems. But the water bill may be most embarrassing for Salt Lake City, whose leaders pride themselves on being green. Briefer said golf courses, by their nature, require significant amounts of water to maintain landscaping. City leaders have worked with golf course managers to set water use targets, she said, which have decreased over time. "They are very good at staying within that water use target," she said. But Zach Frankel, executive director of the Utah Rivers Council, said the usage rates show how residents are footing the bill for the city&apos;s major water guzzlers. Water use is charged at the same rate, Frankel said, but the pipes and treatment plants are funded through property taxes. And government entities, including schools and city golf courses, do not pay those taxes. Those exemptions, Frankel said, give an unfair advantage to the users putting the largest strain on the water system. "Instead of addressing these major inequities, we&apos;re told to go install low-flow shower heads," Frankel said. "Large institutional users using 50 million gallons should pay more than homeowners using 50,000 [gallons]. That&apos;s the bottom line." Despite providing the names and addresses of top residential water users in the past, Salt Lake City water managers refused to release that information this time. After a Salt Lake Tribune story several years ago identified the city&apos;s top water user, that person was harassed, Briefer said. So, the city instead identified residential users only by their ZIP code. The top residential user, a homeowner in the Avenues neighborhood, used 3.7 million gallons of water in 2014. Of the remaining homes in Salt Lake City&apos;s top 10 residential water users, five are located in the Avenues, three are in Holladay and one is in Cottonwood Heights. The top water-using businesses outside the city&apos;s top 20 was Staker Paving, which consumed 32 million gallons. A local representative for Tesoro was unavailable for comment, but spokeswoman Tina Barbee said in an email that fresh water is used for cooling, steam generation and other production purposes at the refinery. Waste water is treated at the plant before being sent to a public treatment facility, she said, and plants are kept to federal, state and local pre-treatment standards. Tribune reporter Annie Knox contributed to this story. *Because of their size, water use at Tesoro and the University of Utah is divided between multiple meters.